The boys had endured a challenging 37th day on the rally; Matt had suffered a burn to his face and then they had been split at the end of the day. To make things worse Henry and Dunc had managed to split Vera’s fuel tank on a rock, like she needed help in breaking down!! 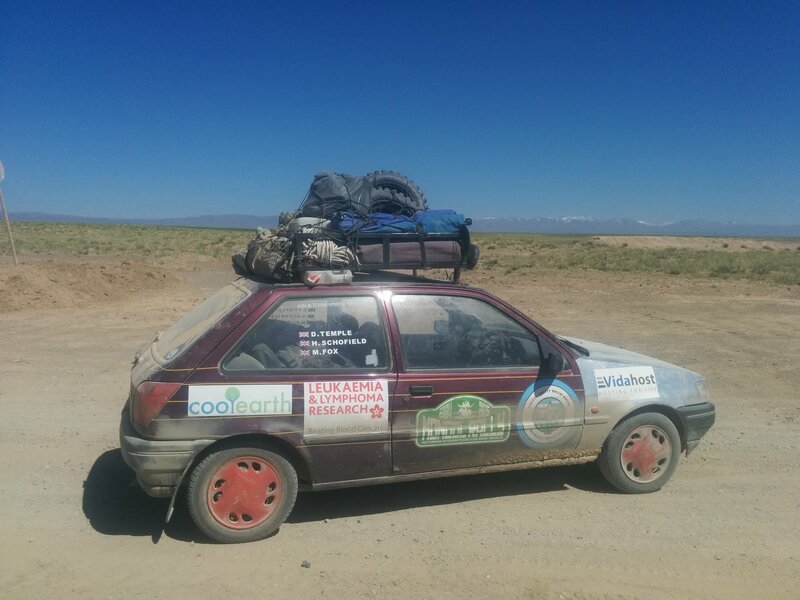 So Henry and Dunc woke up in a crummy hotel in Byankhongor and Matt still on the fringes of the desert with Team Aston Micra and Jennifer (the sole remaining Baked Potato). At this point, however, Matt and the rest at the camp had no idea where the other two were!! So after having some customary porridge they were off in pursuit of Vera, expecting the two boys to have camped just further up the track. As it was Matt managed to get a text off to Henry and he soon got a reply informing him of the predicament the boys were in. By the time the Micra and the Mini were out of the desert, about 45 mins, Vera was already being patched up at a local garage. When they arrived Matt launched into the other two, giving them a hard time for not stopping at the camp with the others and unnecessarily breaking the car, especially as the incident happened on supposedly the last piece of difficult road on the rally! The lads soon put the argument behind them though. After his short outburst Matt turned round and saw Dave and Sam from The Haggis Hunters, the last time the two teams had been together was in Samarkand, Uzbekistan. They were with another team The Yorkshire Special Branch (YSB). YSB had exhaust repairs being done at the same garage as Vera; whilst they were all waiting both Aston Micra and CCBB starting selling off spares (radiators, tyres, tyres etc. ), they didn’t get anywhere near as much for them as they were worth but they got a tank of petrol out of the earnings, although that’s only about £10 in Mongolia! Alan Sugar would have been proud of the boys efforts. Thankfully Vera’s petrol tank was able to be fixed quite easily and the garage were able to bodge YSB’s exhaust into place and therefore a 5-team strong Rolling Thunder departed Byankhongor by mid-morning. Matt was still riding in the Mini, as that was a lot cooler than Vera and Jennifer was proving to be a good nurse. The roads were much improved compared to the gravel tracks of the day before but that didn’t stop Vera getting stuck on a stretch of roadworks where a sandy ramp had to be climbed! These roadworks came just round the corner of a toll booth where everyone had paid a fee to use the road, how cheeky! After the roadworks there were no more real hold-ups all afternoon except stopping for petrol, the roads were good and all 5 cars were working well, what had they all done to deserve this fortune? There was one small annoyance for the CCBB boys though, their beastly off road tyres were very noisy on the tarmac and unfortunately seemed to make the whole car resonate at around 60mph (which was about the most the boys were willing to push Vera to) which became rather annoying after a while. After dinner, consisting of some tinned goods from Aldi in Milton Keynes and some biscuits from a shop in Byankhongor, Matt swapped seats with Dunc and took to the wheel for the first time since his accident. 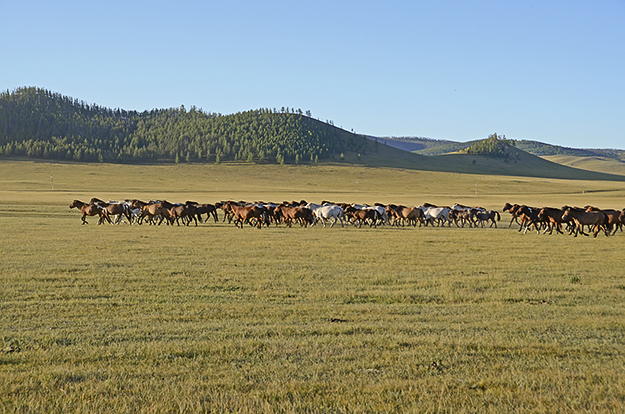 As they pushed further East the landscape became greener and there were many more animals around; the people around here seemed to love their horses and there were even horse themed monuments and statues along the roadside. 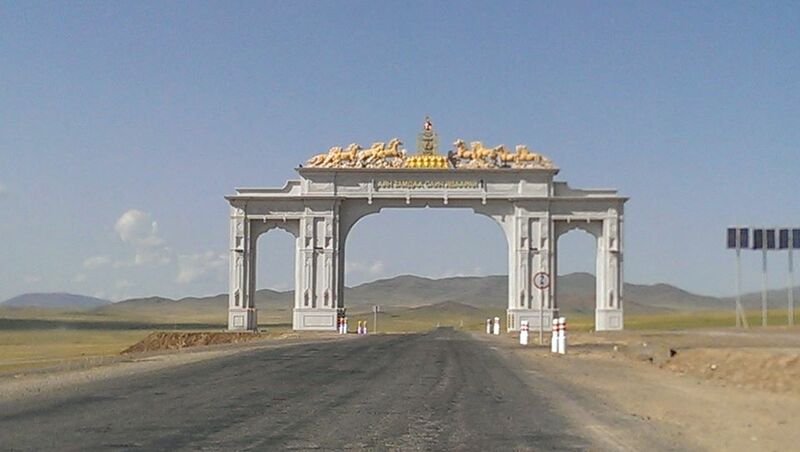 They had all, until now, listened to the advice of Joe (the translator from Khovd) who had warned them to stay clear of the roads at night time. Rolling Thunder was now only a matter of 150 or so miles to away from the capital city of Ulaanbaatar and so decided to take the risk of both stray animals and maniac local drivers and pushed on. 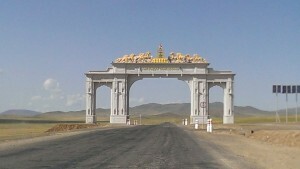 All three boys were now in Vera together and having a ball of a time, hardly able to believe that they might actually make it to the spiritual finish line of the rally (every year previous the rally had finished in Ulaanbaatar, this year they were going to have to go a bit further to the Russian city of Ulan-Ude)! One of the many horse based monuments. At points Matt had to use all of Vera’s rampaging horses to get past slow trucks and buses and generally progress was quite slow as it took time for all of the cars to get past. Eventually The Haggis Hunters and YSB went ahead, they had obviously forgotten how slow Vera and the Mini were! Things weren’t helped by the fact that Aston Micra’s headlights really weren’t up to much good and they eventually had to deploy their powerful spotlights for their first real use on the rally. 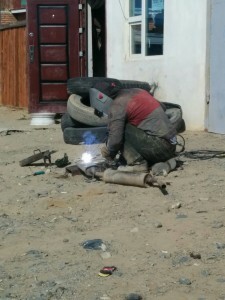 It really was hard work looking out for pot-holes and the odd idiot coming up the wrong side of the road whilst the perpetual moaning of the tyres went on, they were hard miles for the boys but they couldn’t wait for Ulaanbaatar. As the convoy closed in on the capital they were stopped for a police check and for some reason they found Matt’s burn wound quite funny but eventually let the boys on their way. Mercifully the rutted single carriage road opened out into a 4-lane highway just after yet another toll booth and the boys soon found themselves in the city centre racing Aston Micra away from the lights. For once on the rally the boys had done their research into a place to stay for the night and so actually navigated there without too much trouble, they parked in a courtyard near the hostel they wanted to stay at and then went to a local bar for a well earned beverage! After a few minutes at the bar (actually called revolution with the same logo as those in the UK) the other two teams arrived and the barman, who had spent time in England, ordered them pizza! They were all treating it like it was the finish line, and in a way it was there was only one more day of driving left and Aston Micra could always tow the boys if worst came to the worst! The celebrations were definitely justified and the boys had a few beers accordingly.